Spice up your morning! 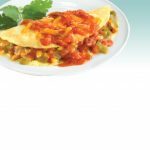 Our Green Chile, Cheese & Ranchero Sauce Egg White Omelette features a low-cholesterol egg-white omelette wrapped around a delicious filling of green chiles and cheddar cheese, and topped with a delectable ranchero sauce. Quick to heat, high in protein, gluten free, low glycemic, and fabulous. Who needs toast and cereal! Wake up and smell the bacon! 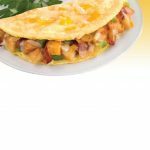 Cedarlane’s Uncured Turkey Bacon, Vegetable & Cheese Egg White Omelette, starts with an egg-white omelette (low in cholesterol!) wrapped around a delicious filling of nitrite-free uncured turkey bacon, potatoes, bell pepper, cheddar and mozzarella cheeses. Quick to heat and gluten free – it’s a natural. Skip breakfast? No way! The breakfast revolution is here! 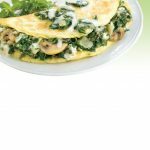 Our Cedarlane Spinach and Mushroom Egg White Omelette is made with a low-cholesterol egg-white omelette wrapped around a delicious filling of spinach, mushrooms, mozzarella and feta cheeses. Quick to heat, gluten free, low glycemic, and great tasting. It’s got it all!